: Chef Frank Brigtsen trained under legendary chef Paul Prudhomme and carries on the tradition of fine Creole-Acadian cooking. At this uptown dining anchor, an interior with still-life paintings, quaint murals and lace curtains sets the mood; we suggest asking for a table in the intimate, sunny front room. The décor is compatible with such dishes as butternut shrimp bisque, and boned pieces of slow-roasted duck with cornbread dressing and a honey-pecan gravy. 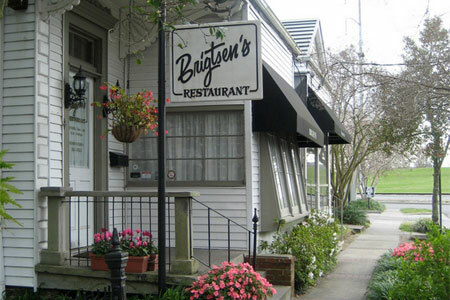 Brigtsen and his wife Marna seem content to reassure customers that south Louisiana cooking is a simple, straightforward affair, and leave the razzle-dazzle to others. And because the chef is present whenever the restaurant is open, consistency is achieved. A passionate fisherman, Brigtsen spends many free days on the water, so seafood of all kinds gets the royal treatment. If you happen to show up during soft-shell crab season, you may just have the meal of a lifetime. For dessert, treat yourself to pecan pie, and a variety of freshly made ice creams. The small wine list is carefully chosen, and Brigtsen’s offers some of the most attentive and personal service of any comparable restaurant in town.